There are roughly 30 different species of scorpions in the Phoenix Valley......the most venomous however, is the Bark Scorpion. When it comes to the way the Bark Scorpion “looks”……here are a few things to notice. Their body is much more slender with a thinner tail and pincers than other scorpion species. Their color is tan; but can also range from a yellowish brown without any markings to stripes running from head to tail. Right after molting has taken place, a Bark Scorpion will be dark yellow with an almost orange tan color. They will have a mark on the front of the head above the eyes. It will be a dark triangle. Scorpions in Arizona will live all year long and can survive the coldest temperatures that the desert can experience. Bark Scorpions have no problem co-existing along with other scorpions. In the winter time, Bark Scorpions will even gather with other scorpions in large groups to nest. Scientists can identify species of insects very easily. And truly, the best way to identify a Bark Scorpion is by watching its behavior. The Bark Scorpion will lay its tail down, parallel to the surface it is on. The tail will still be curled up, watching and waiting for prey to come along. Other scorpion species keep their tails up and above their backs while they rest. 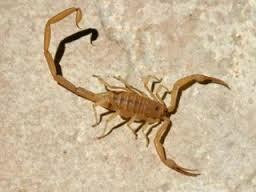 Scorpions can climb walls, bushes, trees, stucco, siding, block walls, interior walls……..you name it. They will also position themselves upside down.